A painting by the French painter Francois Boucher “Apollo and the Shepherdess”. The size of the painting is 129 x 158 cm, canvas, oil. The original meaning of Apollo is revealed by a whole series of cults, especially in the Ionian and Achaean states, which portray him as the protector of some occupations that are closely connected with the life of nature: for example, in the early Greek myth-making Apollo is called the shepherd’s god, the god of pastures and sheep, that is, the defender of the herds, whose good condition mainly depends on the warming rays of the sun and the correct change of seasons. Little by little, all the deities, who were originally only the personification of the forces and phenomena of nature, began to be understood more abstractly, they were looked at from the moral point of view. The God of pure sunlight Apollo became the representative and patron of everything clear and pure in the spiritual and moral realm, the primary source of all education and progress in social and political relations. Thus, Apollo began to appear first of all as a god of singing and softening the violent passions of the game on the zither, why he was given besides the onion – lyre. 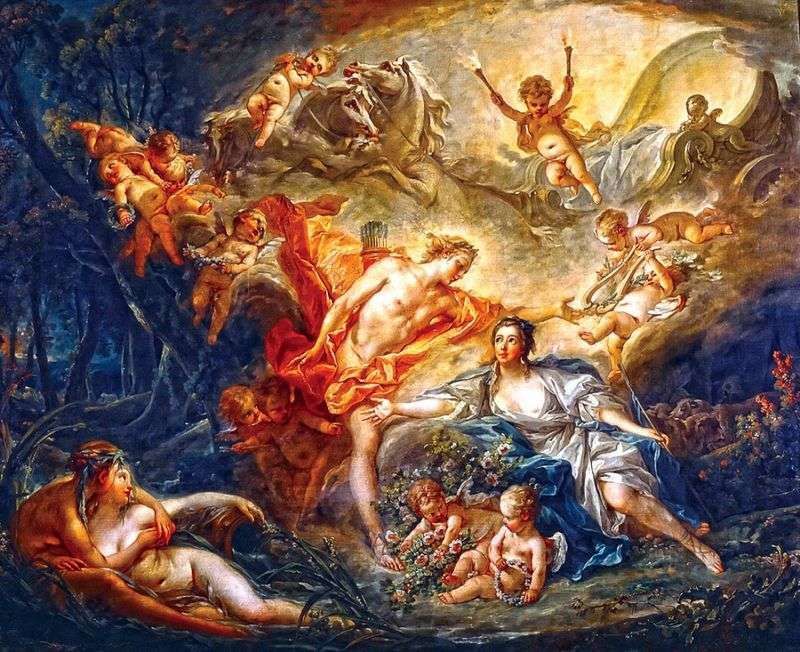 Therefore, in the late myth-making Apollo delighted the gods with his art, stood at the head of the choir of the muses and bestowed loved ones with the gift of singing and poetry. For art, Apollo is the ideal of male, youthful beauty; he is depicted without a beard, long hair that falls on his shoulders, then they rise and are bound upward by a knot; slender, with an expression of pure, divine majesty in his face, Apollo usually, especially when he has arrows and a quiver, is depicted in only one short, thrown over his shoulders mantle; Sometimes, when he plays the zither and leads the chorus of the muses, Apollo wears clothes falling to the feet. The head of Apollo is often decorated with a wreath from the branches of the laurel tree dedicated to it; next to him often depict a tripod as a symbol of prophecy, as such, for example, stood in the holy of holies of the Delphic temple over the cleft and served as a seat for the Pythia. Of animals, Apollo was dedicated, in addition to the neck, in particular the swan, the wolf, the mouse and the lizard. Description and meaning of the painting Apollo and the Shepherdess by Francois Boucher.